"Why are people running in front of bulls Pa?" Josh asked his father. The two sat huddled cozily in his bed watching Encierro, the most famous event of the festival of San Fermín held in the city of Pamplona, Navarre. With over a million global visitors annually, it had become probably the most internationally renowned fiesta in Spain. The festival started at noon on 6 July each year with the launching of a rocket from the balcony of the city hall as part of the pyrotechnic Chupinazo, a globally televised ceremony dating back to the beginning of the 20th century. Bull runs were held daily at 8AM between 7 and 14 July, and the actual run lasted for about 3 minutes. According to Wikipedia, the circuit has only changed slightly since 1852. Hundreds of people ran in front of six bulls and another six steers down an 825 meter (0.51 mile) stretch of narrow streets in the old town of Pamplona. The run ended in Pamplona's bullring where the six bulls were held until they were killed by fully trained bullfighters in a bullfight at 6.30 PM the same evening. While the bullring of the city was the fourth largest in size in the world, it was full every afternoon and tickets were hard to find due to the growing popularity of this adventure sport. San Fermin festival, also called Sanfermines, or Sanferminak in the native Basque language, ended at midnight on 14 July with a beautiful candle light closing ceremony "Pobre de mi" once again outside the city hall and the Plaza del Castillo. It was here in the main square in Pamplona that crowds spilled out into the streets during this 9-day long nonstop celebration to enjoy traditional Basque dancing and music, live concerts, Basque cultural sports, and also international firework competitions each night. It was a time to live, eat, drink, dance and party with family and friends side by side with the locals of Pamplona. Although Encierro at Sanfermines was probably the most famous, bull running was also held in towns and villages across Spain, Portugal, Mexico, Peru, and even southern France during the summer. 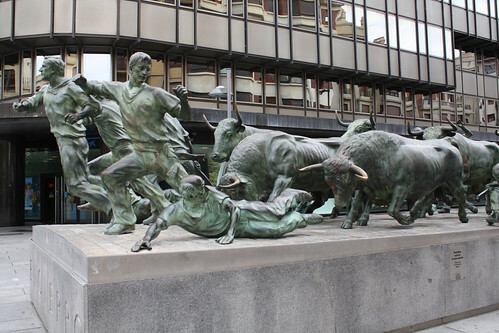 "Spanish Legend has it that the bull runs began in the early 14th century," said Rosh, "While transporting cattle in order to sell them at the market, men would try to speed up the process by hurrying their cattle using tactics of fear and excitement." "This transportation and hurrying began to turn into a fun event where youngsters would jump among the bulls to show off their bravado. When the popularity of this crazy practice took off, it started happening in more Spanish cities and became tradition." "Fun event?" Josh was stupefied, "Many would get hurt in this stampede." "Well," Rosh shrugged, "To each their own poison. They asked for it. So, who are we to judge? I read of two men once, who wanted to run in the Encierro for experiencing the thrill of storming bulls chasing them in hot pursuit." They did. No sooner had they entered the race, it became apparent they wouldn't make it to the bullring before the bulls. The bulls would catch up to them. Those chasing horns on over half a ton of meat on each bull no longer looked like fun. Terrified, one shouted to the other, "Put up a prayer, mate. We're in for it!" "I can't," the other answered, "I've never said a public prayer in my life." "But you must!" implored his companion. "The bulls are catching up to us." "All right," panted the first, "I'll say the only prayer I know. The one my father used to repeat at the table: O Lord, for what we are about to receive, make us truly thankful." "But it is dangerous Pa," laughed Josh, then quickly sobered, "a lot of people must get killed in it. Death is not fun, and no laughing matter either." "Obviously it is dangerous, son" answered Rosh, "that is the reason it pulls such great crowds. But don't just think of the risks. Think of the rewards too. Think of the speed. The drama. The adventure. The pumping adrenalin. Think of the boost in confidence from facing your fears and doing it still." "Only worth it if you survive to tell the tale later," countered Josh. "Aww," said Rosh, "It isn't as deadly as it looks. It is reported that 200 - 300 people are injured during the Pamplona run but most injuries are contusions due to falls and are not serious. Goring by bulls is rare but I agree that it can potentially be life threatening." "But if it were such a fatal sport, it wouldn't be attracting over a million visitors annually. Ayuntamiento de Pamplona says that since record-keeping began in 1910, only 15 people have been killed in Pamplona, most of these due to being gored." "Umm," Josh was skeptical, "doesn't look fun for the bulls anyway." "Yea," said Rosh, "Many animal rights activists oppose the event, as they believe bulls get tortured for entertainment here. In 2002, PETA activists created the "Running of the Nudes", a public demonstration the day before the beginning of San Fermín in Pamplona." "By marching naked, they protested the festival and the following bullfight. Their event has also since become an annual tradition in its own right. So, do you wanna go there when you grow up? For the bulls or the nudes?"